The Ezy-Clean cell is the simplest chlorinator cell available. Not only is it large, capable of producing up to 30gm Chlorine/hour it also is ‘ezy-clean’. The nut at the top of the cell unscrews so the central electrode (the one which collects residue) can be pulled out to be cleaned under a tap. The QT300 cell is the traditional watermaid cell and is an ideal replacement for ageing watermaid cells or for old Poolrite vertical cells. Watermaid use premium quality platinum in their cells to ensure longer life. Watermaid cells have a full 1 year manufacturing defect free warranty and 48 month pro-rata warranty. Watermaid have just brought out a new look Grey power box with a new display light indicator to replace the meter and push button controls instead of a dial. It has a self-cleaning mode light, a low salt light and a no-flow light. The set level and production output are now indicated by an array of indicator lights. The Watermaid unit can handle salt levels of up to 9000ppm making them hard to damage or overload. 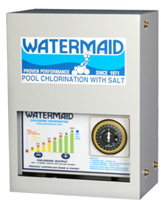 We recommend all salt chlorinators work best with a salt level of 6000-7000ppm. 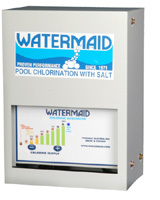 Watermaid is one of the few manufacturers using a 400VA transformer which is required for continuous production of up to 30grams of chlorine per hour, which makes the unit suitable for up to 150,000 litre swimming pools. The large watermaid cells are designed to match the powerful watermaid unit being over-rated so as to ensure longer cell life, easy cleaning and high chlorine output. They also include a new self cleaning function at the same price. Watermaid power boxes have a full 2 year manufacturing defect free warranty. This unit is available with a timeclock. We recommend using separate plug-in timeclocks on pool equipment as they are under a heavy load and easily damaged or, if outdoors, weather affected. Plug-in timers are cheaper and more easily replaced. Visit Watermaid on the web.